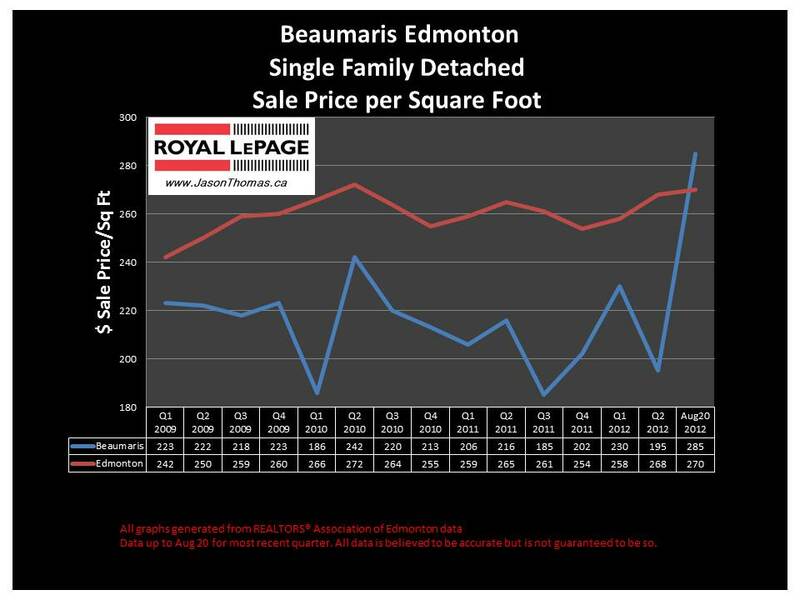 The Beaumaris Edmonton real estate average sale price per square foot has jumped above the Edmonton average for the first time in the last 3 years. We will see if Beaumaris can sustain this, as it is only based on 2 sales in the most recent quarter. Both of those sales in Beaumaris were bungalows which tend to sell for much more per square foot than a two story style home. I tend to think that the average will slip back below the Edmonton average, as Beaumaris traditionally sells in that $220 per square foot range. The highest sale price for a home in Beaumaris this year has been $555,000. The highest sale price for a home in Castledowns year to date has been $750,000. The average time to sell a house in Beaumaris in 2012 has been 38 days. That is a little quicker than the Castledowns average days on market of 43 in 2012, and Edmonton average days on market of 45. Visit Beaumaris Edmonton home values to find out what your home is valued at in today's real estate market.